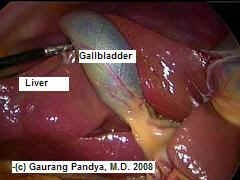 Laparoscopic Cholecystectomy is a surgical procedure by which I would remove gallbladder with Laparoscopic technique. With patient under general anesthesia, typically 1 small incision is made in or near umbilicus and 3, 1 cm incisions are made in the right side of the abdomen. then we stretch the abdomen up by special Carbon Dioxide insufflator. This allows us to work through the space created and with a video system and special instruments we remove gallbladder through the umbilical incision. The advantages of Laparoscopic Cholecystectomy are many and include markedly reduced post surgical pain, quicker recovery and reduced hospital stay. For years surgeons made a 6 to 9 inch incision in the right upper abdomen and took the gallbladder out. This required the patient to stay in the hospital for 3 to 6 days and off work for 6 weeks for recuperation. Not any more. For past 20 years I have used this technique of Laparoscopic Cholecystectomy with very satisfying results. If you suspect that you or someone you know have gallstones then make an appointment with Dr. Pandya in our office by calling (559) 782 8533 for further evaluation and management or call your doctor for a referral.